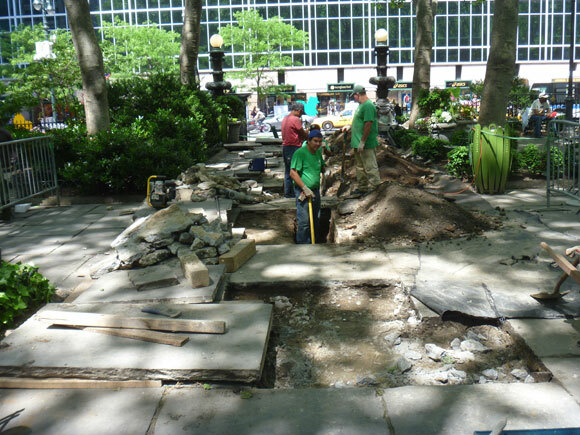 We told you why the lawn work was taking a little longer than usual, and we told you why we walled off a section on the 40th Street side of the park, but you're probably still wondering what all the work crews are doing in the park. Pathway closings like the one pictured below have become a familiar sight this summer. Conduit and a utility box installation near The Tables. Over the last few years, power has been a little unreliable in the park. The system is not properly equipped to handle large scale concerts like Bryant Park Fall Festival presented by Bank of America, and there are too few outlet locations for smaller scale events like Book Club discussions and accordion performances. To improve this, our capital projects team has devised a new electrical grid for the park, as part of a complete overhaul of the power system. The contractors have been working in isolated areas of pathway, in constantly moving sections, to lay conduit for this new grid piece-by-piece. 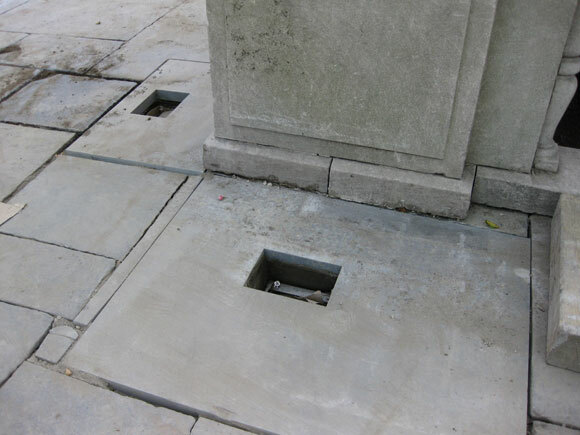 In each section, they lift the bluestone pavers, dig a hole, and install the conduit. Pathway closings have become a necessary step to facilitate this process. Laying conduit on the South side of the Lawn, and working around existing water lines. 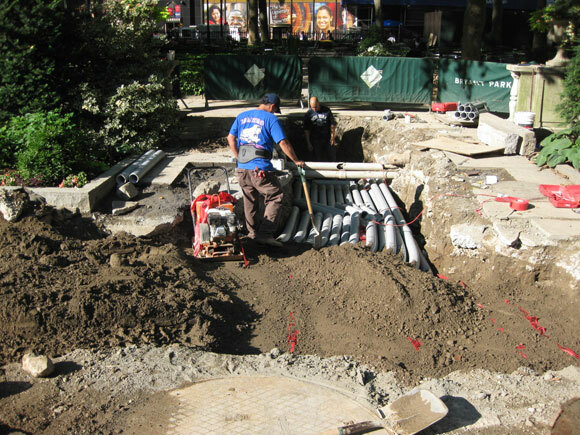 In the coming weeks, the contractors will continue to work laying conduit on the south side of the park, as well as begin to wire the newly laid conduit. You can spot the tedious wiring work in progress, wherever you see large spools of wire. As the summer progresses, additional work will be done to upgrade and add lights to the park's stone balustrades and monuments. The digging has already been completed for these projects, so disruptions for this project should be mild. Locations for balustrade lights have already been prepared.